It’s only a matter of time before our beach vacation begins. This means that I’ve been working out like a mad-woman, drinking gallons of unsweetened iced tea, and eating as light as I can between bites of Peanut Butter Cup Ice Cream and Cookie Dough Brownies. Somehow I’m thinking this is the formula for allowing myself to feel comfortable in a bathing suit this year. Somehow I’m thinking that I’ll still feel pudgy… no matter what… just because that’s the way I always feel. 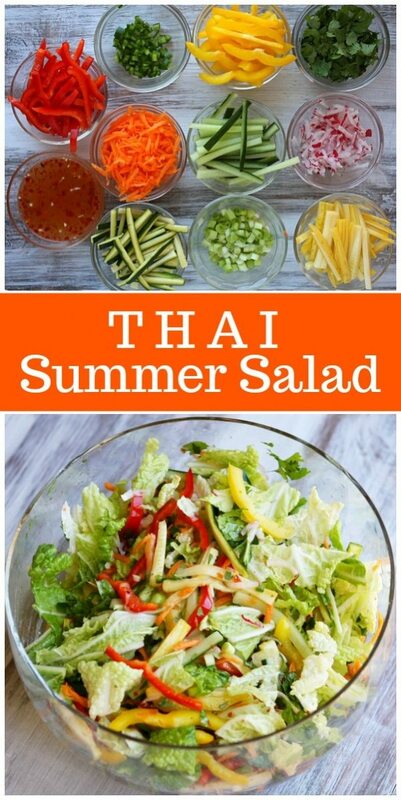 This Thai Summer Salad recipe is one that I made in preparation for bathing suit body! There’s a lot of good stuff in the salad. Fresh stuff. Stuff you should be eating all the time but you probably don’t because it’s just too darn healthy. 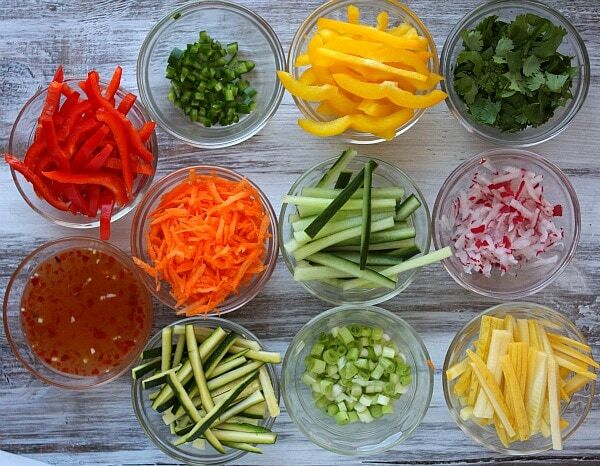 See all of those cute little, nicely julienned vegetables? My sister did that for me. And I took the pictures. Isn’t she the best sister ever?!? 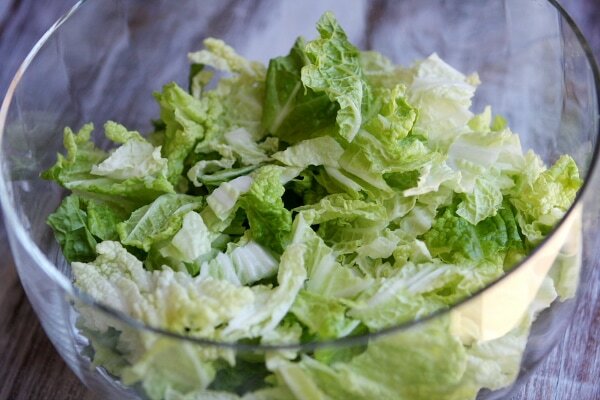 This salad is made with napa cabbage– the Chinese sort. You could always go with your regular-old green or red leaf type, but I like the cabbage. Consider it roughage. 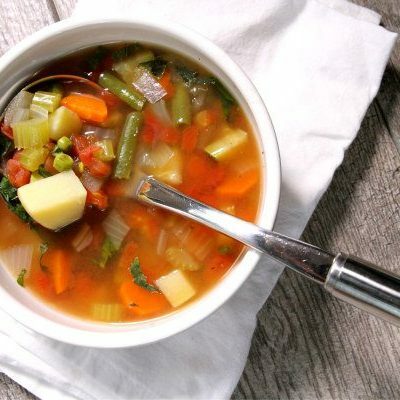 Add all of those nicely chopped vegetables to the cabbage. … until everything is colorful and beautiful. I read once that to be healthy, you should be “eating the rainbow.” I suppose this sort of thing fits that bill. 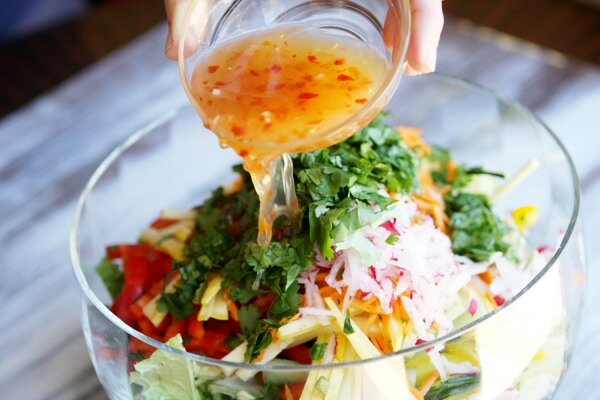 Then add a very simple and mildly spiced Asian dressing. And it’s ready to eat. I give you permission to eat this entire bowl of salad. 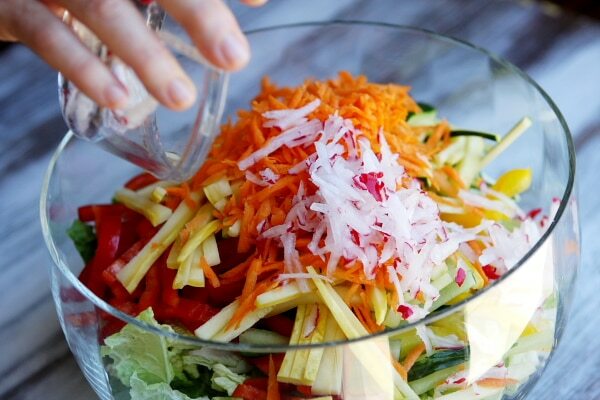 In fact, if you eat this entire bowl of salad that is designed to feed 10 people… you’ll only be taking in a total of 200 calories. Imagine that? 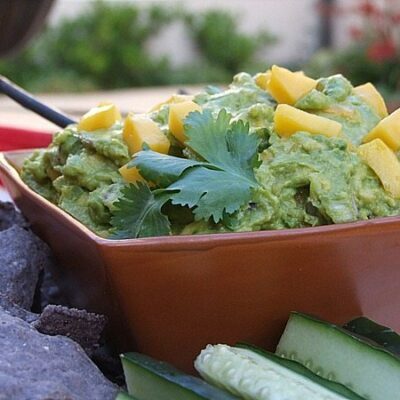 You’ll be munching for an hour and you’ll likely just burn off those 200 calories using your jaw muscles as exercise. Pretty cool, huh? I recommend adding grilled chicken to the salad to make it a complete and filling meal. It’s rather good that way. 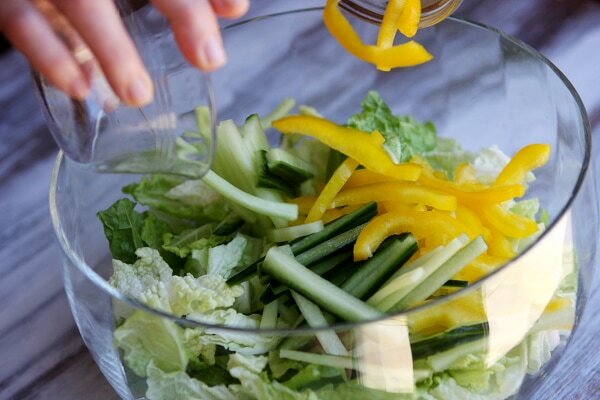 To prepare the salad, combine the salad ingredients in a large bowl. 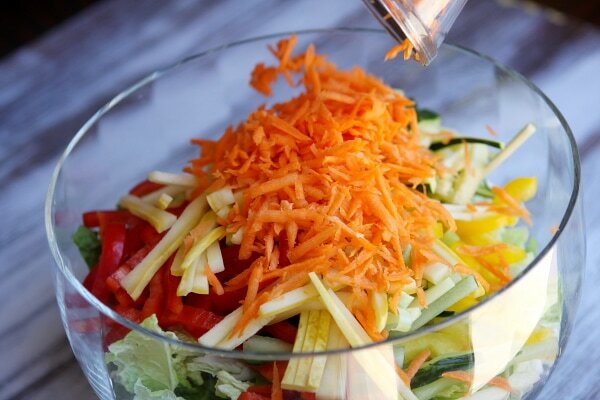 To prepare the dressing, combine dressing ingredients in a small bowl and whisk together until sugar dissolves. 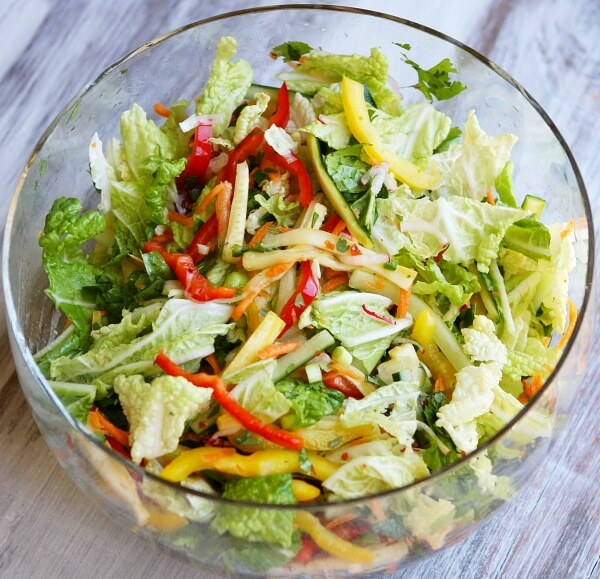 Drizzle dressing over salad and toss well. Serve immediately. If preparing this recipe as GLUTEN FREE, just make sure that you use a brand of fish sauce that is known to be GF. Chile garlic paste can be found in Asian markets and usually the Asian-foods aisle of regular markets. 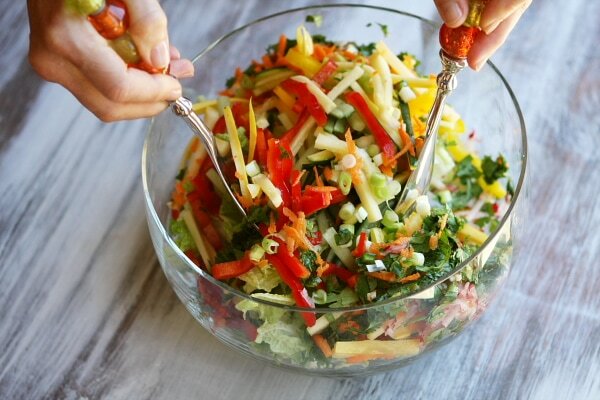 Add grilled chicken to this salad to make it a main dish. That looks good, and I like the spicy Thai dressing! 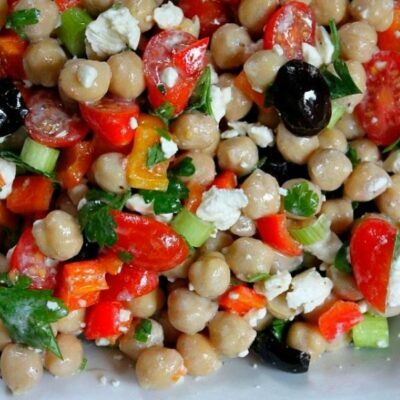 Thanks for the shout-out for my Easy Summer Lunch Salad. 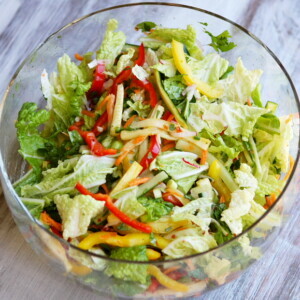 Love how refreshinig this salad is! I have no idea! You could try Googling “sub for fish sauce” and see what comes up.